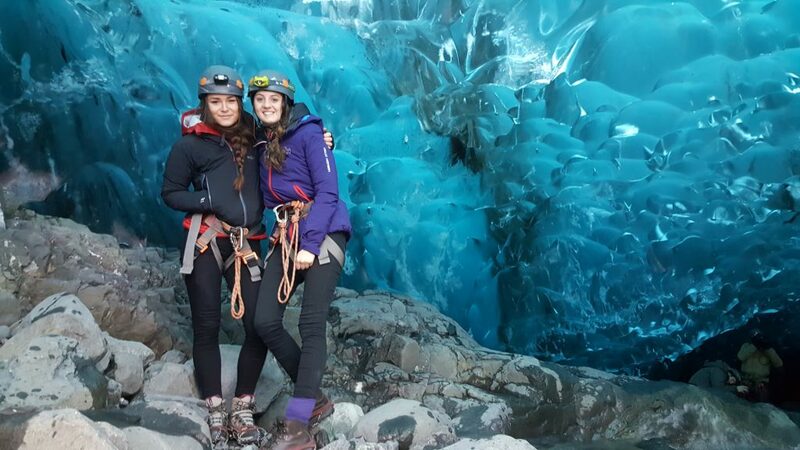 At Glacier Adventure, we offer some wonderful ice cave tours. But if this is an activity you’ve not done before you might have a few queries. Here are our most common questions and answers for our Ice Caves tours. From when to book, how to stay safe and what to wear. 1. Can you explore the cave all year? 2. Should I book a tour in advance? 3. 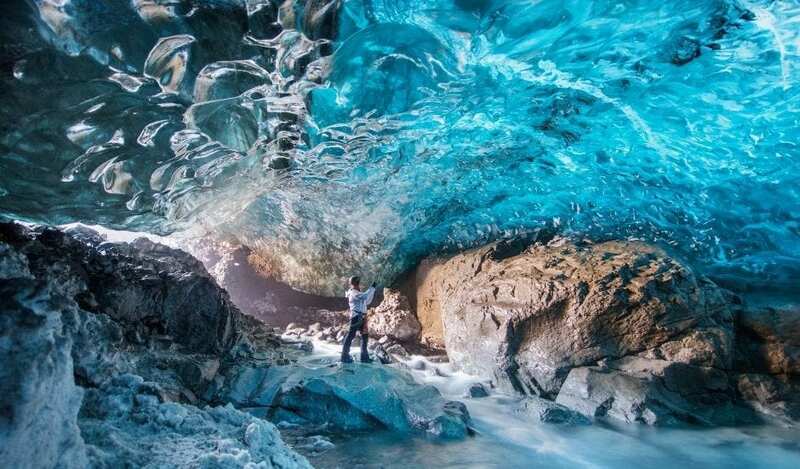 Which ice cave tour should I book? 4. How many people are in the cave? 5. How long are you in the ice cave? 6. How much time should I allow for the tour? 7. How do I get to the ice cave? 8. How do I stay safe in the ice cave? 9. What safety equipment is included? 11. What if I don’t have waterproofs or suitable boots? 12. What other items do we recommend you take? 13. Do the tours ever get cancelled? 1. 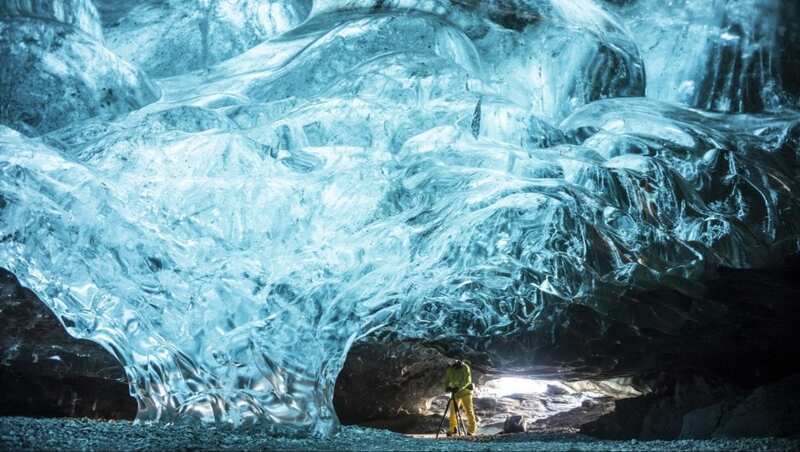 Can you explore the ice cave all year? 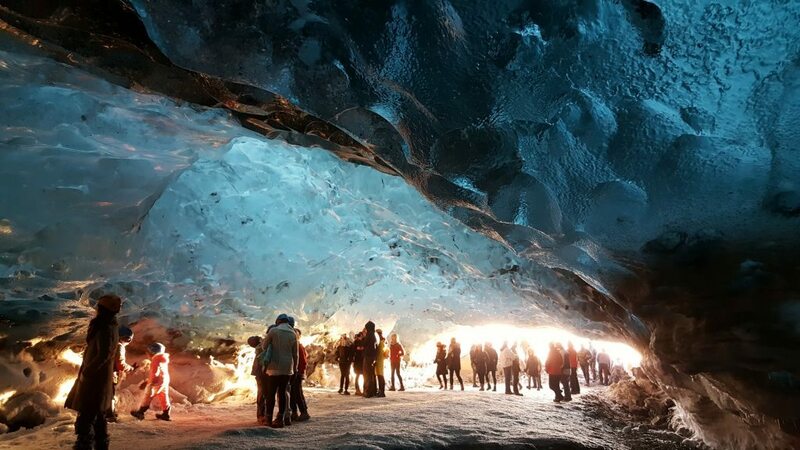 The Ice Cave tours with Glacier Adventure are a winter only activity. We visit natural ice caves that are only safe to enter during winter time in Iceland. We aim to start around November 15th and run until March 15th. But because we are in the hands of Mother Nature this can sometimes be earlier or later. We offer 5 tours each day. Two in the morning at 09.30 and 10.00. Then another three tours in the afternoon at 13.00, 13.30 and 16.00. Safety is the most important factor when deciding whether our tours go ahead. The key date is when the river stops running through the cave. We are pretty sure that you wouldn’t want to go exploring before then! 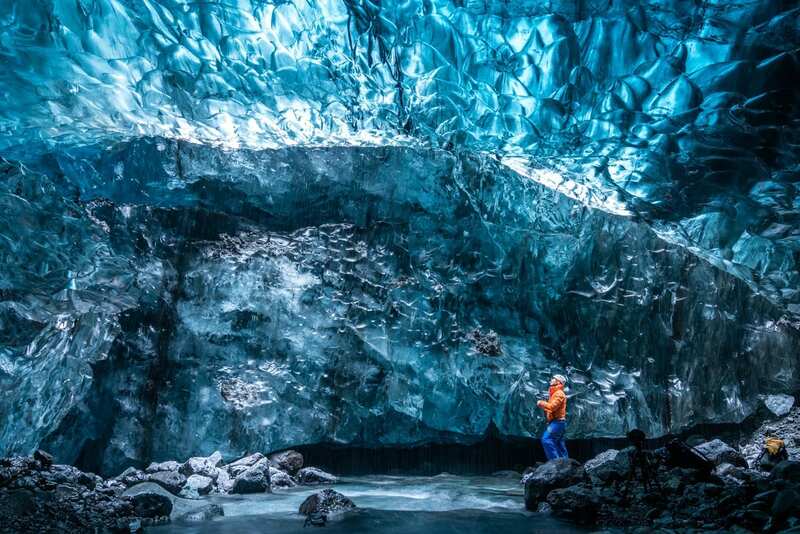 We also offer the ‘Blue Ice Cave Adventure’ tour. This is available for longer (from November 1st to March 31st). The reason for this is that this cave is further up the glacier. Therefore the temperature gets colder quicker than the lower cave, meaning it is safer to explore sooner. We offer the Blue Ice Cave Adventure tour once a day at 09.00. Exploring an ice cave is a unique experience. This does mean it is very popular with tourists visiting Iceland in winter. We would recommend booking your place in advance. To ensure you are able to book the time that suits you best. However, we do sometimes have last minute spots. So please contact us and we will endeavour to book you a place. Our Blue Ice Cave tour offers a more isolated experience. Fewer tour companies visit the cave. However, it does require a good level of fitness to do this tour. We do not recommend if you have medical conditions. Please contact us if you are concerned. We recommend this tour is you enjoy photography. As it offers some wonderful opportunities to capture great pictures. The Ice cave tour we have up to 20 people per group. Whereas the Blue Ice Cave Adventure, our group sizes are much smaller, up to 8 people. Please note we can’t guarantee to be the only group visiting the ice cave. This has become incredibly popular winter activity in Iceland. Other tour companies bring guests to visit the cave which can cause it to be crowded. Please expect to share the cave with additional groups. If you book on the Blue Ice Cave tour, we tend to have this to ourselves. But again, we are unable to guarantee it will just be our group visiting. Your time in the ice cave can last between 30-40 minutes on the Ice Cave Adventure tour. And slightly longer in the Blue Ice Cave Adventure, nearer 60 minutes. Times can vary due to the conditions. We aim to ensure you have enough time to take photographs and enjoy the experience. We would love to give you an accurate time for how long your tour will last. However, due to weather and driving conditions our tours can vary in length. 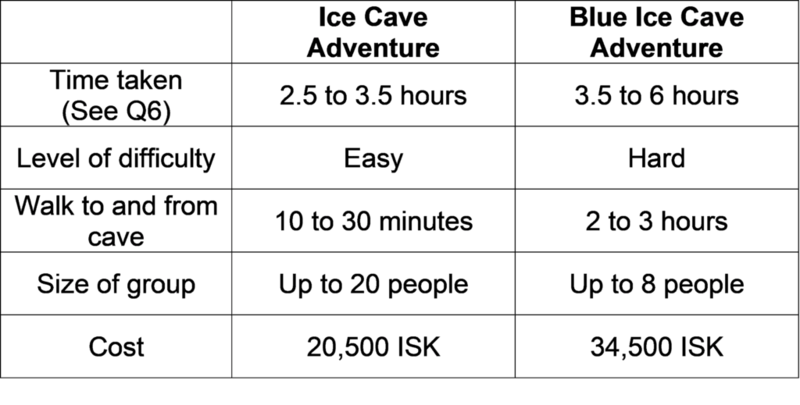 Below are our average times to give you a rough idea. This can tour last between 2.5 to 3.5 hours. This tour can last between 3.5 to 6 hours. Including up to 3 hours walking to and from the cave. The tours include transportation to and from the ice cave. We kindly ask that you arrive at our meeting point at least 20 minutes beforehand. We like to ensure we have a prompt start and allow you as much time in the cave as possible. Our meeting point at Hali Country Hotel also has a restaurant and museum. If you arrive early there’s plenty to do and see before your tour begins. The roads are all gravel paths (not suitable for normal vehicles). This means we use our Super Jeep. You’re in for a treat as this is a monster vehicle. It’s great fun going over all the huge bumps in the road. Be sure to buckle up! Safety is very important at Glacier Adventure. We have a licence provided by Icelandic Tourist Board to function as a tour operator. 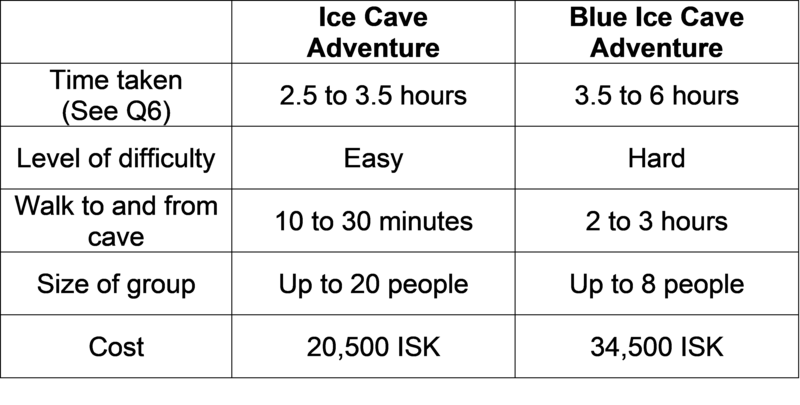 And we are also members of VAKINN. This is an independent quality and environmental system run by Icelandic Tourist Board. 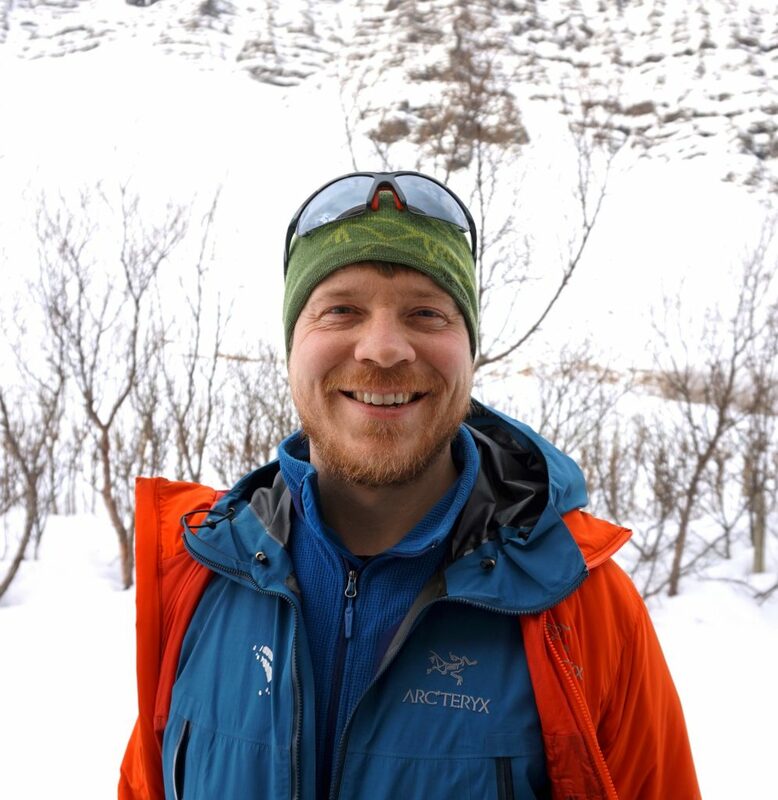 Our tour guides are all certified by AIMG (Association of Icelandic Mountain Guides). They are local to the area and very experienced in taking tour groups into the ice caves. 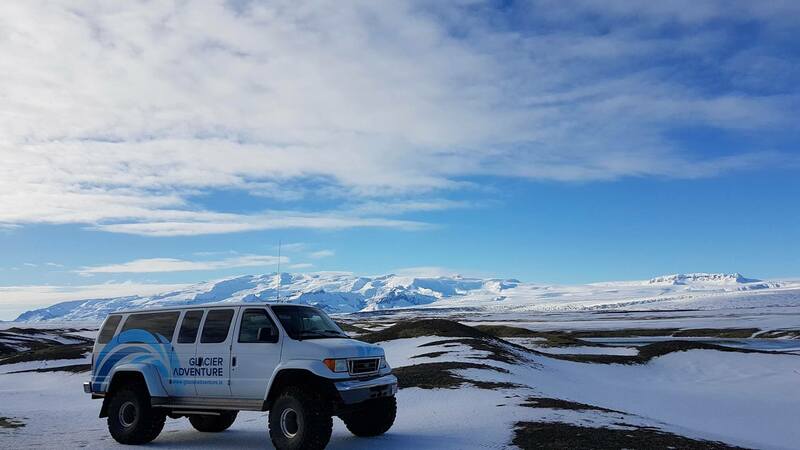 A lot of our team are also active members of the ‘Icelandic Search and Rescue team’. We want you to have an amazing time in the ice cave. But please remember ice caves can be unpredictable. It’s important to listen to your guide at all time. And that way we can ensure you have a fantastic time and stay safe. You will all be given your own helmet. These are adjustable so don’t worry we can fit them to your size. Most of our guests have woolly hats for them to fit over too. We also provide all our guests with some stylish new footwear. Yes, you’ve guessed it, crampons! For the Ice Cave Adventure tour you will be provided with our ‘Slide on’ crampons. These are really easy to put on over your shoes or boots. And will allow you to be more comfortable exploring the cave. 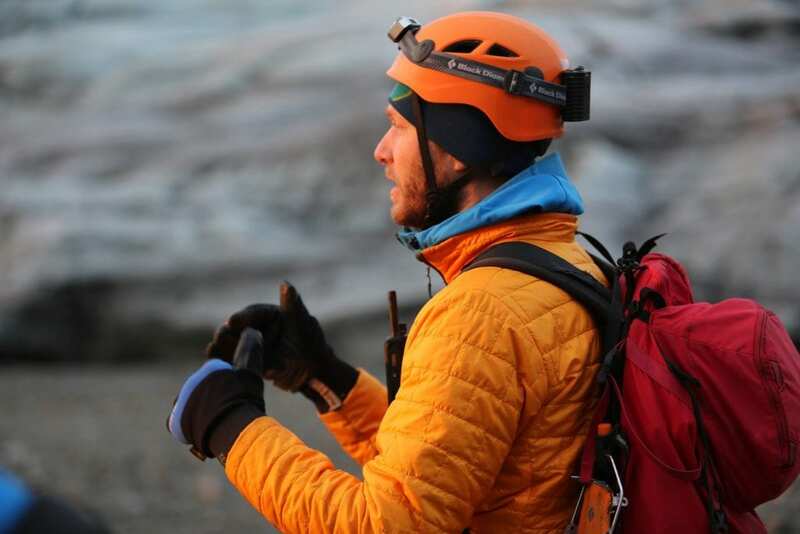 For the Blue Ice Cave Adventure tour you will most likely need the traditional hard ice crampons. Our guides will teach you step by step how to put them on. In some cases we use the ‘Slide on’ crampons but only when conditions allows us to. Sometimes you may need a headlamp in the cave. We will also provide these for your tour. And for those who book on the Blue Ice Cave Adventure. You will be provided with a safety harness. Only to be used in the event of an emergency. Iceland in the winter months can get very cold. And exploring an ice cave means you do have some shelter from the wind but it’s still pretty cold. We recommend that you wear several thin layers in order to trap the air between them. Instead of one big jacket. *Remember you need to be able to fit your crampons to whatever boots/walking shoes you are wearing. We recommend hiking boots. We are able to rent out both rain gear and mountain boots for the tour. Please request when you make your booking. *Please note these are all options items you may wish to consider bringing with you on the tour. -Small backpack – for any personal belongings/medication. -Camera (and tripod) – optional. 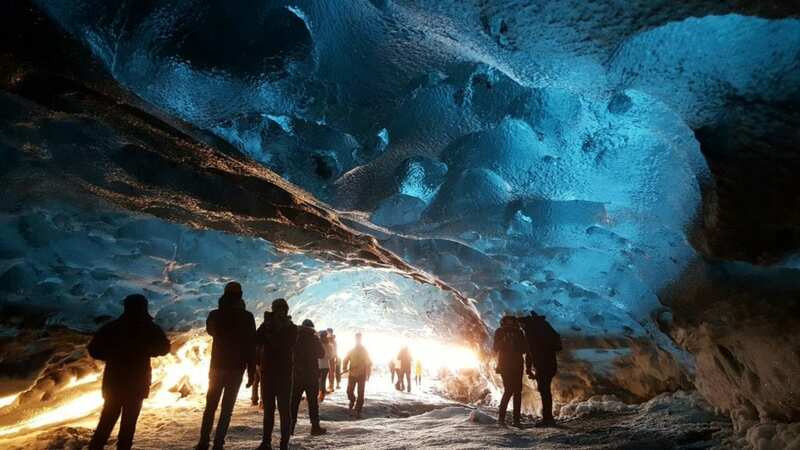 We do recommend for the Blue Ice Cave Adventure tour. Unfortunately, we do sometimes make the decision to cancel tours. The weather in Iceland is every changing. So if we have had heavy rain we may decide that it’s too dangerous to do the tour. As the ice becomes too unstable to walk on. We appreciate that this can be disappointing. But again, safety is the most important factor for us. As an alternative, we can offer you the Super Jeep and Glacier Explore tour. However, this is also weather permitting so please understand if this is not possible. Read more about the tour here. If no alternatives are available or if you prefer your money back. We will offer you 100% refund. We hope that has answered most of your questions about the ice cave tours with Glacier Adventure. However, if there’s still something you’re not sure about please don’t hesitate to contact us. We will be happy to help. Glacier Adventure looks forward to welcoming you on our tour.